In the previous post we looked at how dependencies and dependency injection work in .NET Core. New libraries can be downloaded to the solution in various ways: through the NuGet GUI, The NuGet package manager console, by editing project.json directly or letting Visual Studio figure out if a certain library could solve a missing reference problem. Dependency injection can be achieved through a built-in IoC – Inversion of Control container – where we register the abstractions and the corresponding dependencies in Startup.cs. We can give various lifetimes to the dependencies: transient, scoped and singleton. Then whenever a class requires a dependency the IoC container will serve up the registered concrete implementation automatically. In this post we’ll see how to add a configuration file to the project and how to read from it. There’s a lot of documentation on this topic available on the Microsoft .NET Core guide here. We’ll go through some of it in this post. As usual we’ll be working in our demo app DotNetCoreBookstore. 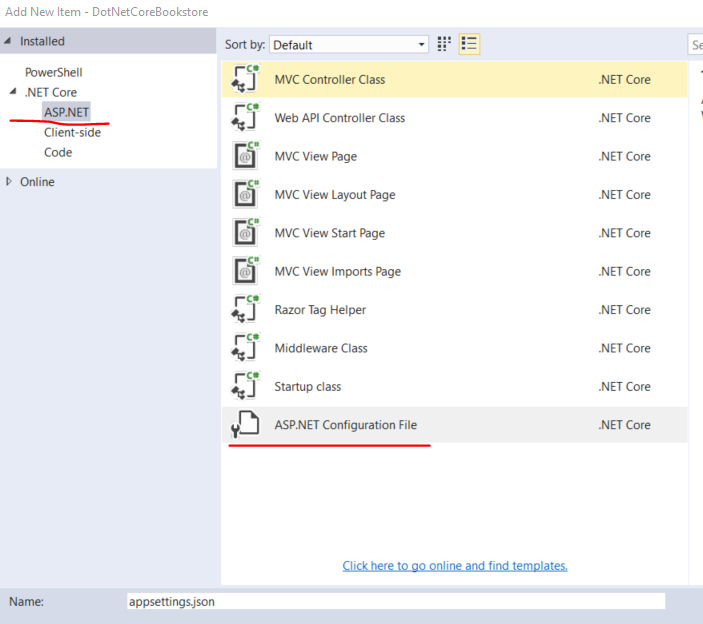 The ASP.NET Core template in Visual Studio adds a web.config file to the project. Probably all ASP.NET developers are familiar with web.config and have used it for various configuration purposes. Web.config in ASP.NET Core however plays very little role. The Visual Studio template only adds a couple of lines there meant for IIS only. The web project itself will have no knowledge of this file. If you try to read your application properties from it the usual way, like ConfigurationManager.AppSettings[“setting-name”] it won’t work. The generated appsettings.json file adds a ConnectionStrings property for us with a sub-property called DefaultConnection. That section is meant to store the database connection strings. We haven’t got that far yet so we’ll ignore it for the time being. Note that the setting file can have any name, appSettings.json is not mandatory, but it seems to be an accepted convention. You can probably guess that application configuration is no longer done in XML but JSON. The flexible JSON structure allows us to store entire JSON trees as application settings. We’re no longer tied to simple key-value pairs like in the XML appSettings section of traditional web.config. Reading from a configuration file demonstrates the modularity of .NET Core. We’ll need to bring in two dependencies from NuGet and write some code in Startup.cs so that the application becomes aware of the configuration file. If there’s a higher stable version by the time you read this post then feel free to add that instead. Save project.json and you’ll see that the packages are downloaded from NuGet in a matter of seconds. The gateway into reading the application configuration is the ConfigurationBuilder object in the Microsoft.Extensions.Configuration namespace. ConfigurationBuilder has a fluent API that allows us to chain the various configuration sources so that we can read all of them from a joined source. The point is that we don’t need to store all the application settings in a single JSON file. They can come from various sources such as environment variables, other JSON files and whatever source that implements the IConfigurationSource interface which is also located in the Microsoft.Extensions.Configuration. We saw the IHostingEnvironment interface in the previous post. Its ContentRootPath property is very helpful in our case. The SetBasePath does exactly what the method name suggests and sets the base path for the registered files. AddJsonFile declares the name of the settings file and without the base path the application wouldn’t find it, it needs the full file name. The “optional” property declares whether the registered JSON file is optional or not. If it’s optional and not found when the Build method is called then no exception is thrown. Otherwise if the file is mandatory and is not found then we get a FileNotFoundException. If “reloadOnChange” is set to true then the settings will be reloaded if the file changes during runtime. The AddEnvironmentVariables extension method reads the environment variables that can also be used as application settings. Note that it’s perfectly fine to register other JSON files by calling AddJsonFile multiple times. “colours” will have 4 items as expected. The colon is used to separate the various subsections in the JSON structure. “secondColour” will get the value “Green”. We get hold of the children of the Languages node first. Then for each child, such as “.NET” there is a string array where each array member is a child so we need to load them separately. secondJvmLanguage will be set to Scala. …which in my case resolves to C:\Program Files\Java\jdk1.8.0_73 . The class name doesn’t have to match the section name in appsettings.json, so it’s fine that the class is called ProductMeasures and the configuration section is called Measures. It’s also fine to have different property names as we have complete freedom over the binding rules in a lambda expression. An important point with the options objects is that we don’t need to pass around the IConfiguration object. We can have dedicated sections in appsettings.json or in other config files and use those sections in dedicated C# POCO objects. Each and every object that requires some configuration values for its work can be handed a specialised options object without sending the entire list of settings. We’ll stop here now. We’ll continue our journey in the next post. Loving this ASP.Net Core series and your blog in general. It should be a mandatory reading for every .Net developer. Keep up the good work!